How did bird nests evolve? This past weekend I was doing a public raptor program at Lake Elmo Park Reserve. The presentation was in the amphitheater of the modern campground. I arrived early to set up my materials but, as soon as I stepped out of the van, a flitting bird caught my eye in the massive old oak tree towering overhead. I grabbed my binoculars and caught sight of a beautiful Warbling Vireo sitting on a branch. As I watched, the bird flew down to a nest. This was only my second time every seeing a Warbling Vireo nest and they are beautiful and well hidden. 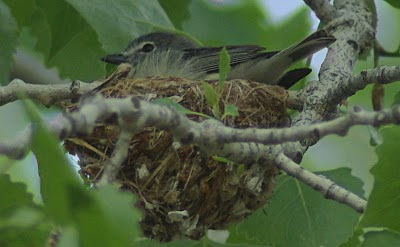 Here's a photo of the very similar looking nest of the Plumbeus Vireo that lives in the western United States. 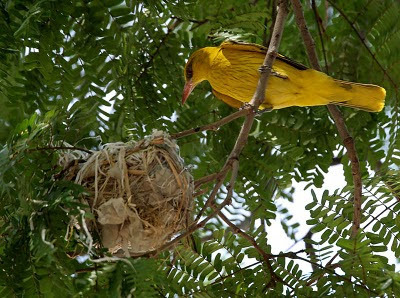 What struck me about the nest is that it is nearly a pendulous nest like that of the Baltimore Oriole. While any nest building is mind boggling, the Baltimore Oriole weaves a nest that is a basket that hangs from a tree branch. I wondered if a nest such as that of a vireo is an intermediate between a cup nest sitting on top of branches and that of the pendulous nests that completely hang freely. Scientists called this intermediary style where a nest is held by the edges a pensile nest (though some people also call pendulous nests pensile as they technically are still held up by the edges). If we had a time machine and visited the nests of Baltimore Orioles ten-thousand years ago would they look more like a vireo nest? Are pensile nests an evolutionary middle ground between cup nests and hanging pendulous nests? It seems fairly logical that those birds with deeper nest may have had better hidden nests and thus the genetic code for progressively deeper and deeper nests was passed on more than the genetic code for less well hidden nests. We might get some insight into the evolution of oriole nests by looking at the variation in nests that different species of orioles build. I stumbled upon this image of a Eurasian Golden Oriole. Sure enough, the nest looks much more like the pensile vireo nest. 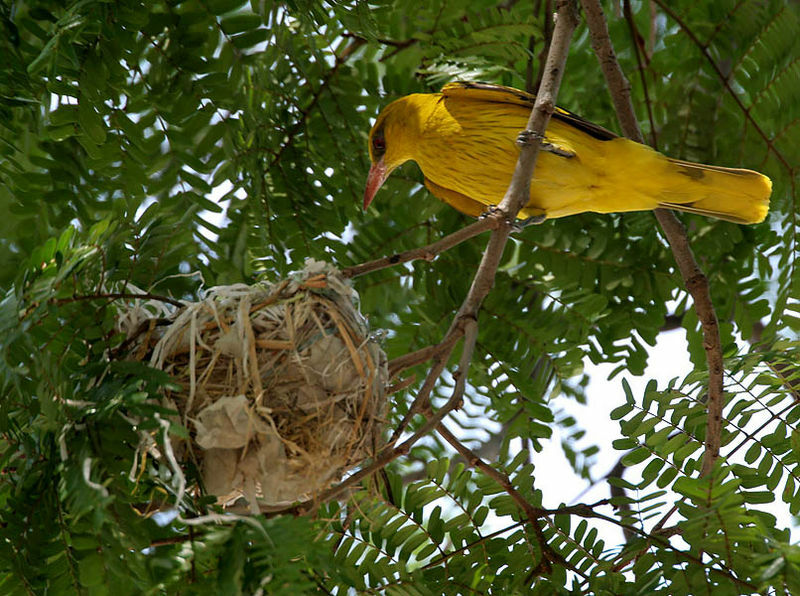 Other orioles such as the Audubon's Oriole also have a similar, less pendulous, nest. I'd love to see a phylogenic tree of orioles or all birds to see if there is a correlation between how closely related the species are and what type of nest they build. A phylogenetic or cladistic tree that correlates nest type to how "old" the species are would also be most telling. Birds nests are fascinating to study as you can see how different species have taken the concept of a nest in new directions. The evolutionary ancestors to birds, the dinosaurs built nests as well though I wonder if nest building in trees came before or after the advent of flight. We know that species other than birds, notably non-flying mammals, build nests in trees so I don't think flight would necessarily have had to come before arboreal nests. There seems to be a lot of creationists on the web who love to claim that no one can explain how nests evolved. They claim that no one can explain how it could happen and then when someone very reasonably explains a possible way it can be explained they change the argument and don't want to see how it could have happened, they want proof that it DID happen in that way. I have actually seen someone use the argument, "Well how do you know, YOU weren't there." Not the strongest debate style. When you point out that nests actually predate birds they reject that fact because they also reject the fact birds evolved from previous species. In their mind, fully formed nests (in all forms) had to suddenly arise in all their complexity. The concept of a cup nest slowly changing to a pensile nest and then to a pendulous nest form over thousands of generations is simply lost on them and they resort to. "How do YOU know, were YOU there?" The whole process of trying to explain it to them is silly as they reject evolution as being real. They essentially say, "Explain how something evolved but, oh, by the way, any answer that involves evolution is wrong." It is sort of like saying, "Prove to me that glass is made of sand but if you take me to a glass factory and show me the process I'll reject that answer as false because glass factories don't exist." Anyhow, for those of us who find evolution fascinating, nests are a great example of how complexity be slowly built up over generations to produce incredible structures. There's nothing impossible or magical about it but it sure is fascinating. A small and insignificant comment: European Orioles are not closely related to North American birds. Our orioles are actually in the blackbird family, whereas the Old World birds are in a distinct and quite different family. Thanks for the comment Dan. Not a small point at all. I hadn't checked to see if Old World orioles were Icterids. The Audubon's Oriole sure is closely related though and it is interesting to note nest differences. I'd be very surprised if someone hasn't taken the latest cladogram of birds based on genetic information and cross references it with nest type. I did it in my head a bit and there does seem to be greater complexity in nest type as you move up to the more recent species. It would be interesting to see how accurate my quick scan was as it was limited to those birds who's nesting I am familiar with. I am an evo-denier that says your nest notion is absurd. You must account for arboreal nests from the start. The first twigs, which of course couldn't hold eggs. You block out completely the notion of how they first formed. You discuss fully formed fully egg-supporting types. So you fail, you blind yourself to the impossibility of your answer, and move on. And rag that challengers don't accept your non-answer. Typical of evolution. Awesome Stephen. Given that you deny evolution is not possible I can see how you would believe that nests must have come into creation fully formed lest they not function in an arboreal setting. I obviously favor a non-arboreal history of nest evolution based on fossil nest evidence. I'm guessing you would ignore that evidence but hey, that's your hang up. I'll refrain from finishing my comment with a pithy insult as you did.